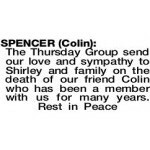 3.7.1933 - 29.3.2019 Loving husband of Shirley. Father of Greg, Richard, David (dec), Jenny (dec), Sue (dec). You fought the good fight, now at peace. 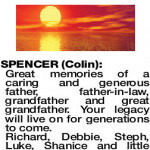 A Funeral Mass for the late Mr Colin Spencer of Midland and formerly of Kalamunda will be held at Our Lady of Lourdes Catholic Church, 207 Lesmurdie Road, Lesmurdie commencing at 10.00am on TUESDAY (9.4.2019). At the Conclusion of the Mass, the Funeral Cortege will leave from the church and will arrive at the main entrance of, KARRAKATTA Cemetery, Railway Rd, Karrakatta commencing at 12.30pm for a Burial Service. 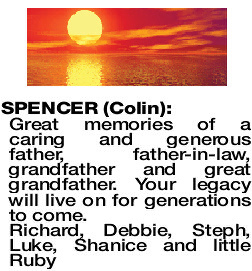 SPENCER COLIN Great memories of a caring and generous father, father-in-law, grandfather and great grandfather. Your legacy will live on for generations to come. A wise and generous mentor. Deep sympathy to Shirley and Family. 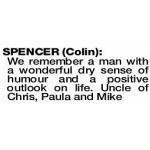 Heartfelt sympathy for Shirley and family with the passing of Colin, a much admired and long time friend of Jim since university days. 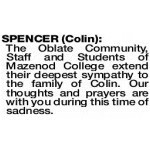 SPENCER COLIN The Oblate Community, Staff and Students of Mazenod College extend their deepest sympathy to the family of Colin. Our thoughts and prayers are with you during this time of sadness.